This project resulted in the development of a framework for making asset management decisions on low-volume bridges. 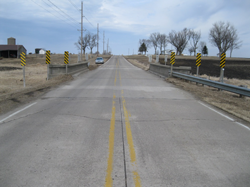 The research focused on low-volume bridges located in the agricultural counties of Iowa because recent research has shown that these counties have the greatest percentage of structurally deficient bridges in the nation. Many of the same counties also have the highest crop yields in the state, creating a situation where detours caused by deficient bridges on farm-to-market roads increase the cost to transport the crops. Thus, the research proposed the use of social return on investment (SROI), a tool used by international institutions such as the World Bank, as an asset management metric to gauge to the socioeconomic impact of structurally deficient bridges on the state in an effort to provide quantified justification to fund improvements on low-volume assets such as these rural bridges. The study found that combining SROI with current asset management metrics like average daily traffic (ADT) made it possible to prioritize the bridges in such a way that the limited resources available are allocated in a manner that promotes a more equitable distribution and that directly benefits the user, in this case Iowa farmers. The result is a system that more closely aligns itself with the spirit of MAP-21, in that infrastructure investments are used to facilitate economic growth for Iowa’s agricultural economy.